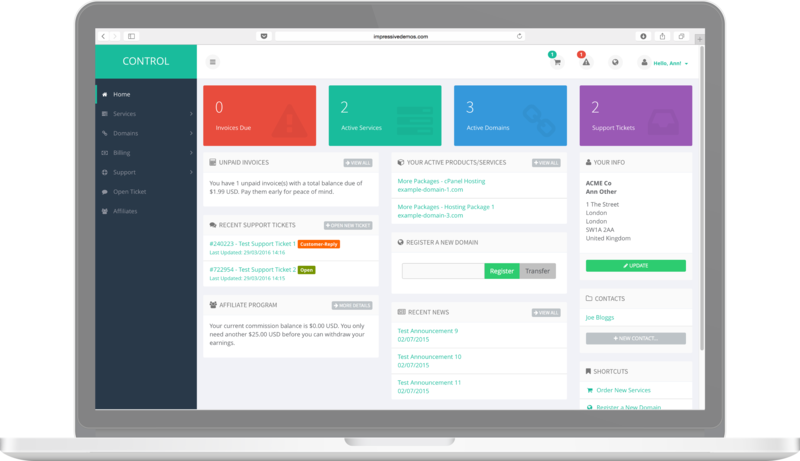 Control theme for WHMCS is a modern and fully responsive control panel style client area theme for WHMCS. Control theme is designed to be fully compatible with the latest version of WHMCS (currently version 7.7.1) including all the latest WHMCS features, such as MarketConnect, automated SSL provisioning and management, spotlight TLDs, dynamic menus and sidebars. A matching cPanel style is also available (purchased separately). Control theme includes two main color schemes, green and blue, and six styles/variations. You can preview the different . 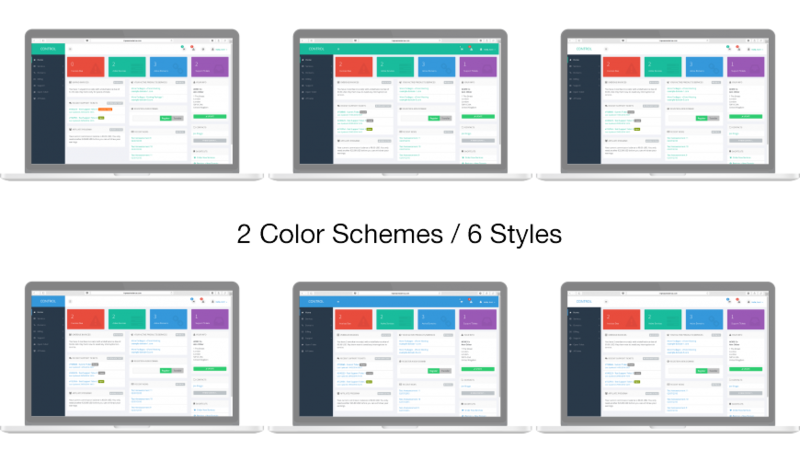 You can preview the different color schemes and styles in our theme demo. All order form templates are available in both green and blue color schemes. The theme also includes automatic RTL layout switching for RTL languages. All of our products come with a full 30 day money back guarantee. If for any reason you are not entirely satisfied with any of our products, please contact us	within 30 days of purchase for a full refund. Very nice theme and support is good when needed or asked a question. Pretty good theme, I'm very satisfied! I'm interest to know, does this theme support this specific plugins for WHMCS and if it doesnt what would be cost of implementing support for those? Thanks for your question, and sorry for the delayed reply. Unfortunately we don't get notifications when reviews are posted on here. We have previously tested the DNS Manager addon, which works fine with the theme. We have not tested the other two, but I would not envisage any problems. Should you have an issue with either addon, please let us know and we will aim to resolve this for you (free of charge). Very good theme, easy installation work with no issue. Thanks, glad that you're happy with the theme and support - thanks for taking the time to leave a review. Awesome theme, awesome support. The developer even helped us make custom changes dark theme. Went above and beyond with GDPR update to theme. Overall 5 stars! Thanks Andrew, glad that you're happy with the theme and our support service! I appreciate you bringing the GDPR issue to our attention, we'll be rolling this out shortly for all customers. Working together with our customers like yourself and taking onboard their suggestions enables us to continually update the theme. I'd give a 5 star for the product as it is for now. Saddly I'd give a 2 star rating for their support, hence it's non-existence at the moment. I can't say how good or how fast "Impressive Themes" responds, because I couldn't send my support request yet. There's a Problem with their Support Ticket System. When I try to send a Support Ticket, I get a 404 error after I clicked "Create Ticket". I'm sorry to hear that you've been having difficulty contacting our support team - we've just tested our support ticket system and it is working fine for us. If you are still having difficulty creating a ticket, please contact us via email on support [at] impressivethemes.net or send us a message via our Facebook Page. By far Impressive Themes is the best option. I have the Control and I am absolutely happy with it. The template is updated almost instantaneous when a new version of WHMCS came. Works perfect out of the box even with Modules Garden. The support is real and they are incredible helpful, they always hit the nail with the correct answered. I can no ask for more. Thanks to the Impressive team. Hi love the theme, just wondering if you have an easy to use CMS to access and make changes or if you have to go into the code each time? Our theme does not include any kind of CMS functionality. The majority of content within the theme is served dynamically from WHMCS (eg. product descriptions, text from the WHMCS language files, etc.). Any additional changes to page layouts would need to be by editing the theme files. Your theme is compatible with Interworx Extended (developed by Modules Garden)?. We have not tested the theme with this specific module, however, it looks very similar to the cPanel Extended and Plesk Extended modules (which we have tested) so I would not anticipate any problems. We offer a 30-day money back guarantee, so should you purchase the theme and find that it does not suit your requirements, we will be happy to provide a full refund. once downloaded the template, how do I proceed to the installation? If you have any difficulties, please open a support ticket via our online support desk and we will be happy to help. 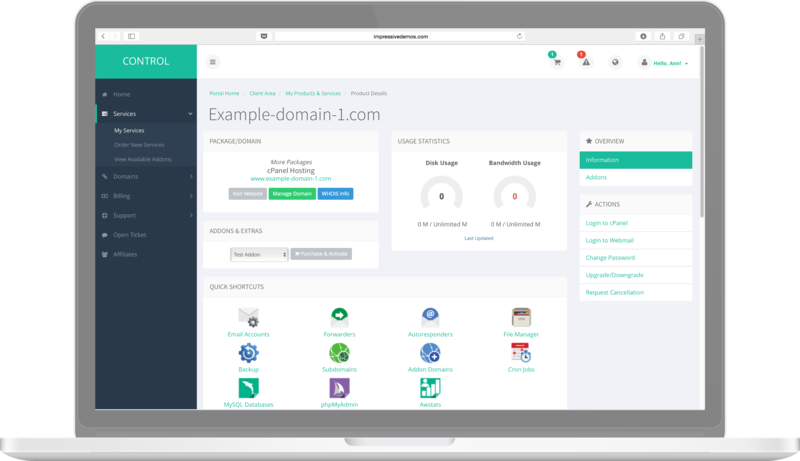 Most beautiful and powerful template for WHMCS. Also quick and helpful support team always helping with everything you will need. Thanks Impressive Themes.. I'm glad that you're happy with the theme and our customer service! If I can be of any further assistance, please don't hesitate to get in touch. Again many thanks to Chris for his excellent work and support!!! Highest recommendation! Brilliant theme. Easily customisable. Very impressed! We have been most impressed by this theme and specifically the after sales support that we have received. Chris more importantly has always gone above and beyond when assisting us with any questions we may have. He also has assisted us in every way possible and in this business finding such a high level of support is rare and we are glad we have found such a company that exceeds all our expectations. I highly recommend this theme and the support is fantastic!!! Beautiful and very configurable WHMCS theme. Works very well. Support is great. Courteous, fast and efficient. I highly recommend Impressive Themes! Thanks Yasuyo, glad we were able to help. With little CSS modifications, it became exactly as i wanted it to be. If you want a professional looking portal, pick this theme up right away. Thanks, glad that you're happy with the theme, and thanks for taking the time to leave a review. One excellent theme, excellent support, excellent guy. Thank you Chris for all your help!!! You're welcome Roman, thanks for the kind words. I'm glad that you're happy with the theme and our customer service. Really well thought out and well written theme. Saved me a stupid amount of hours having to write my new theme, I just started with this one as the "boilerplate" and it was pretty much ready to go. I easily modified everything I needed to and added some SCSS fun and I'm going to minimize all the JS and CSS in my version. The point here: FREEDOM. Great support too! Chris has been a legend and kindly answered any of my queries and taken on suggestions and quickly provided a fix for a little display issue I found. Hi Ben, thanks for taking the time to leave a review. Glad that you are happy with theme and our customer support. The first really well designed theme for WHMCS 6 that is unencoded and where the support is also top-notch. The design and responsiveness is also very good, they keep improving with every update. Any comments, suggestions and/or recommendations are taken seriously by Impressive Themes. Thanks for the feedback, and suggestions for improving the theme. I'm glad that you're happy with the theme and our customer service! If there was ever one thing really lacking in WHMCS it was a well designed, responsive theme. The Control theme by Impressive solves that in an instant. Very easy to set up and will save you hours/days/weeks in customisation. Well worth the money. Thanks Dave, I'm glad that you're happy with the theme. This version is compatible with WHMCS 7.5.0 - 7.5.1. It is not compatible with earlier versions of WHMCS. This version addresses an anomaly with the $carttpl varbile on the domain renewals page, which prevented the page from loading correctly when called from a child order form template. This version introduces minor updates to the phone number input JS, as provided by WHMCS in version 7.4.2. Improvements to order form error templates. This version is compatible with WHMCS 7.4.0 - 7.4.2. It is not compatible with earlier versions of WHMCS. Fixes syntax error on Control Alternative Standard order form template view addons page. This version is compatible with WHMCS 7.2.2 – 7.2.3. Following the addition of the "Store" menu item to the main navigation in WHMCS 7.2, a small number of customers with a large number of product categories have experienced display problems with the main navigation menu, as the theme was not built with such a large menu height in mind. To compensate for this, the main layout has been recoded using the CSS3 Flexbox method, rather than absolute positioning as was previously used. This enables the page height to dynamically increase to match the height of the main navigation and presents a better user experience. This version is compatible with WHMCS 7.2.2 - 7.2.3. Issue in the brand.tpl file in versions 2.4.0 - 2.4.1 which caused the pdf invoice logo, if specified, to override the theme logo. Issue in the upgrade.tpl file which caused some alert messages to be shown twice on page. This version fixes a bug in the domainregister.tpl file in version 2.4.0. This version introduces a new layout for the view cart page based on customer feedback. One of the most common items of feedback highlighted by our customers is that the enter promotion code and estimate tax links on the view cart are not obvious enough causing their customers to struggle to find them. With this in mind we have updated the view cart layout to include the enter promotion code and estimate tax forms within the main page body, above the checkout button, to make the checkout experience more user friendly. We realise, however, that this might not be to everyone's liking, so the original view cart style is also available as well, you can choose between the two different page styles in the cart-options.tpl file. The other major update in this version is also focused on the order form templates, and again based on customer feedback. This version intrduces a new option (found in the cart-options.tpl files) which allows you to define the number of products shown per row on the view products and view addons page in both the *_standard and *_compare order form templates. Update language variable used for client area home page services tile, for improved translation. This version is compatible with WHMCS versions 7.1.0 - 7.1.2. Fixes a problem which caused the setup fee for addons to be displayed twice on the view cart page. Fixes an error inherited from the WHMCS standard_cart order form template whereby the wrong error message was displayed when attempting to order a hosting package using your own domain name, when that domain name was already assigned to a hosting account. Updates url for ion range slider style-sheet on configure product page to use dynamic variable in all order form templates. This release introduces compatibility for WHMCS version 7.1.0. It is not compatible with older versions of WHMCS. This version is compatible with WHMCS versions 7.0.1 - 7.0.2. This release adds support for right-to-left (RTL) layout/languages, one of the most requested features for Control theme. A new theme option and functions are introduced enabling users to select either <em>left-to-right</em>, <em>right-to-left</em> or <em>auto</em> (the new default behaviour). When auto is selected, either left-to-right or right-left layout shall be assigned depending on the currently active language. The languages for which right-to-left layout is used can be configured in the theme-functions.tpl file, but by default includes Arabic and Hebrew. Various theme files and the main theme CSS files have been changed to allow for right-to-left layout, see the changelog below for more details. This release fixes a bug with datatable filters in line with WHMCS version 7.0.1. This release introduces compatibility for WHMCS version 7.0.0. It is not compatible with older versions of WHMCS. When the sidebar is hidden, you can choose the method by which it is revealed, either by sliding the main content to the left, and partially off the screen, whilst the sidebar is shown (this is the current behaviour), or by "squashing" the main content to make way for the sidebar. This version is compatible with WHMCS version 6.3.1. CSS fix to improve display of notifications popover on mobile / small screen sizes. This update introduces a new feature for Control Theme, based on user feedback, which enables you to enable or disable the primary WHMCS navigation display for guests (non-logged in users), configurable via the theme-options.tpl file. This release also removes the redundant theme-config.tpl file. 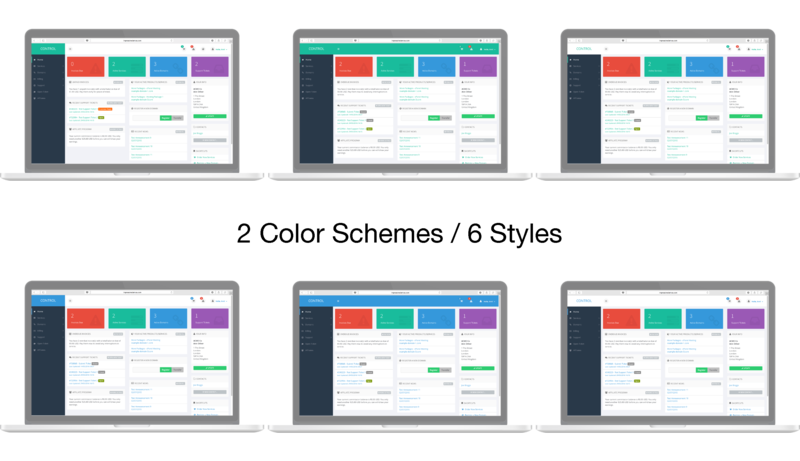 This is our first major update for Control Theme and introduces a new color scheme, blue, as well as five additional styles/variations. Updated for compatibility with WHMCS 6.3.1.